If you’re using Prevent Direct Access (PDA) Gold, you probably come across the term “original links”, “protected links” and “private links”. And you may wonder what original, protected and private links are? What are they for? When to use one versus the other? If you care about protecting your valuable files and documents, you should read this article carefully. 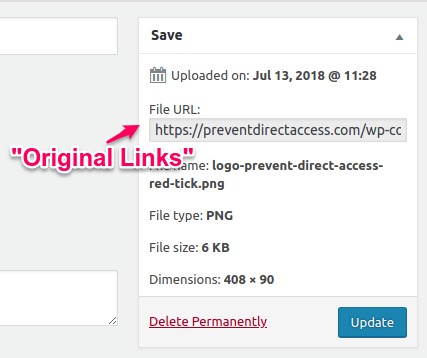 What is an original vs protected link? Basically, when you upload any files to the Internet through your websites or blogs, there will be a link (URL) for you to access them directly. It’s known as “File URL” on WordPress. To differentiate it with other links, we call it “original links” or “unprotected links”. Once you protect your private files with our Prevent Direct Access Gold, unauthorized users could not access them directly anymore. That is to say, your original links are now inaccessible to anyone but your website admins by default. Since version 3.0, PDA Gold actually moves your protected files into our own protected folder. So the file URLs are actually changed but will be updated automatically. We called them “protected links”. Prevent Direct Access Gold will automatically allows you to create the so-called “private links” or “expiring download links” to access and possibly share these protected files with certain groups of people. These private links are not indexed by search engines while providing the only way to access and download your protected files. We use these terms interchangeably, and sometimes, together as “private download links”. By default, our plugin automatically generates a random private link for you, which looks like preventdirectaccess.com/private/58575f26ae274. You can customize your own private links by editing their slug to something more descriptive. You can even change the prefix URL of your private links from “private” to a word of your choice so that they will more meaningful and legitimate to your users. A custom private download link would look something like preventdirectaccess.com/private/this-is-my-new-ebook. When to use private download links? As mentioned earlier, while private links are automatically created for you to access and share your protected files with certain people on our Gold version 2.0, you have to manually create them on version 3.0. But did we mention that everyone who gets your private links will be able to access these files anytime and anywhere? That’s when you need to restrict and expire your private download links. Prevent Direct Access Gold allows you restrict access to your private download links by a number of clicks, days and IP addresses. For examples, if you limit your private links to 10 downloads, they will be invalid on the 11th click. Similarly, you can set your download links to expire after a number of days or only allow certain IP address to access your files. Now you have total control over who and how long the users could access your protected files with private links. Once you’ve protected your files, their file URLs are no longer publicly accessible to anyone but the admins. These protected links will come in handy when you have a membership or e-commerce website in place. In other words, if you want to share your protected files with your subscribers or paid members at large, use protected instead of private links. You can specify who can access all your protected files under Prevent Direct Access Settings. You can grant access to admins, specific user roles such as “subscriber” and “editor” or all logged-in users. Alternatively, you can set the access permission on each individual media file using our Access Restriction extension. Once done, you can use the protected links of your private files in your content as usual. Don’t worry, your files are still protected. If your members are to share these files with others, they won’t be accessible. 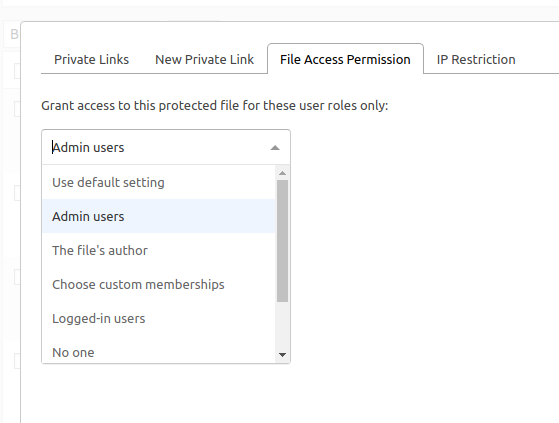 In other words, once the File Access Permission option is set, your files are protected against the public but not these pre-set user roles. In short, use private download links to share your private files via email or on social platforms with certain people. Just make sure you expire these private links in advance. If you have a membership website, use protected links in content to share with your members instead.